Under the Rolex Learning Center’s roof will be an array of facilities, for study, teaching, research, socialising, entertainment and administration. The main library, containing 500,000 printed works, is one of the largest scientific collections in Europe; four large study areas can accommodate 860 students with office space for over 100 EPFL and other employees; a state-of-the-art multimedia library will give access to 10,000 online journals and 17,000 e-books, with advanced lending machines and systems for bibliographic search; a study centre for use by postgraduate researchers will provide access to the university’s major archive and research collection, and there are teaching areas including 10 .bubbles’ for seminars, group work and other meetings and a Language and Multimedia Centre and associated administration offices. The CRAFT Laboratory (Centre de Recherche et d’Appui pour la Formation et ses Technologies), EPFL’s research centre carrying out pioneering work on new learning technologies, offers innovative approaches to text and learning; a career centre is open to students, the student union (Agepoly) and the EPFL Graduates’ Association (A3). There will be a multimedia bookshop and an EPFL shop. The Rolex Forum, an amphitheatre with a stage of 310m2 is a venue for up to 600 people, to be used for conferences, lectures, performances other large scale events. A variety of catering outlets include a cybercafé, a self-service cafeteria and, at one of the summits of the building, a high quality restaurant with outstanding views of Lake Geneva and the Alps, all open to the public. Five external patios, intimate courtyards to be sympathetically landscaped with informal seating, will provide outdoor relaxation areas for visitors and students. The opening hours for the library and building are from 7 am to midnight. The Rolex Learning Center is above all a library and learning space devoted to the cultivation of knowledge by an array of different methods. It has one of the largest collections of scientific literature in Europe, with over 500,000 volumes. In addition, an exciting range of new pedagogical technologies in the building, as well as the layout itself, are innovations to the public’s approach to texts and learning. The most audacious aspect of the new library is its lack of physical boundaries. The large open space is defined by its artificial geography. It groups silent and calm zones along its hills and slopes, rather than offering traditional cloistered study rooms. Recognising the importance of social interaction to learning, the open space experience encourages solidarity between students in the struggle to obtain the best individual academic results, and an open flow of ideas to improve collaborative efforts. Book loans can be done en masse – with RFID students can check a pile of books out and return them by placing the pile on an electronic shelf along with their card. As the technology progresses, it should also be possible to locate a book on the shelves using a smart-phone app. Since its move to the new campus in 1968, EPFL has purchased a number of important antique volumes of scientific literature. The collection comprises rare editions dating from the 16th century, which include works by Newton and Galileo, and will be housed in a special display case as a central feature of the new building. Laboratory is the Center for Research and Support of Training and its Technologies – an avant-garde approach that combines computer interfaces with real world interaction to improve learning techniques and spaces. Already developed learning technologies for the CRAFT lab include interactive furniture, paper/computer interfaces, and eye-tracking devices. Future technologies for the new library are already on the drawing board. They are extensions of previously developed CRAFT technologies adapted to the new learning environment. Among the proposed future technologies is an interactive lamp fitted to existing tables. It would allow the public to project short messages onto the wall or ceiling of the building, indicating study themes, moods, or an appropriate level of noise for the area. Along the same theme, a real-time map of the building could indicate the noise levels of different areas in library, or show the texts the users have typed into the tables. Designed by the Japanese architectural practice SANAA, led by Kazuyo Sejima and Ryue Nishizawa, the Rolex Learning Center is a radical and highly experimental building, designed for new ways of study and interaction in the 21st century. 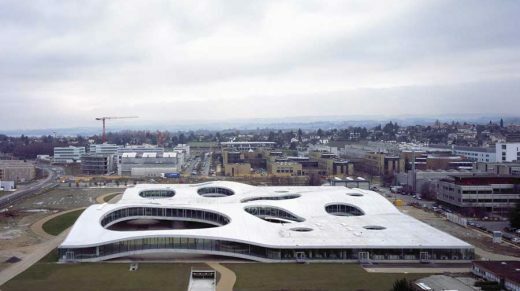 Located centrally on the EPFL campus, and its new hub, the building is essentially one continuous structure spread over a site of 88,000m2: The building is rectangular in plan, but appears to be more organic in shape because of the way that its roof and floor undulate gently, always in parallel. With few visible supports, the building touches the ground lightly, leaving an expanse of open space beneath which draws people from all sides towards a central entrance. Inside, the hills, valleys and plateaus formed by the undulation often make the edges of the building invisible, though there are no visual barriers between one area and the next. Instead of steps and staircases, there are gentle slopes and terraces. Clearly, but without dividing walls, one area of activity gives way to another. Visitors stroll up the gentle curves, or perhaps move around the space on one of the specially designed .horizontal lifts’, elegant glass boxes, whose engineering is adapted from everyday lift design. As well as providing social areas and an impressive auditorium, the building lends itself to the establishment of quiet zones and silent zones, acoustically separated areas created through changes in height. The slopes, valleys and plateaus within the building, as well as the shapes made by the patios, all contribute to these barrier-free delineations of space. In addition, clusters of glazed or walled .bubbles’ make small enclosures for small groups to meet or work together in. The topography lends an extraordinary fluidity to the building’s flexible open plan – a flow that is emphasised by fourteen voids in the structure, of varying dimensions. These are glazed and create a series of softly rounded external .patios’, as the architects describe them. The patios are social spaces and provide a visual link between the inside and the outside. They are very much part of the building. From the higher areas, visitors may enjoy views not only of the campus but, spectacularly, of Lake Geneva and the Alps. With all its unity and variety, the Rolex Learning Center is, as described by Kazuyo Sejima on the announcement that SANAA had won the architectural competition, an .intimate public space’. The Rolex Learning Center embodies the aims and philosophy of the EPFL, setting the scene for different kinds of collaborative, cross-disciplinary research, regarded as essential to advances in science and technology. It offers flexibility to use the building in many different ways, now and in the future, to absorb new technology and working methods, as they come on stream, many of them developed within EPFL itself. The building emphasises sociability, getting together for coffee, for lunch, for study, for seminars, to stimulate informal encounters between people of all the key disciplines. It is designed to be a landmark, a place people will want to visit, allowing EPFL to reach out to the surrounding community and internationally. The engineering and construction of the Rolex Learning Center is highly experimental and innovative. For the 3-dimensional curved concrete shells, SANAA worked with structural engineer, SAPS, to find the shapes with the least bending stresses by making computer simulations. After repeating this process numerous times, engineers Bollinger und Grohmann and Walther Mory Maier made detailed calculations to arrive at the final shape. For the construction, SANAA worked closely with the total service contractor, Losinger Construction, on the final calculations and physical implementation of such large and gentle slopes. The concrete execution had to be precise because of the complex façade system that needed to absorb both the concrete shell deflection movement and the construction tolerances. One example of precise execution was the use of laser-cut 2.5m x 2.5m wooden formwork, which was positioned using GPS technology on site. For the ventilation and heating, the undulating one-room volume was also studied via computer simulation to determine the periods when natural ventilation was possible and when floor heating would be necessary. This helped to achieve a low energy consumption target. Essentially, the building is made up of two .shells’. Inside the two shells are 11 under-stressed arches. The smaller shell sits on four arches, 30-40 metres long, while the larger shell rests on seven arches, 55-90 metres long. The arches are held by 70 underground pre-stressed cables. The main structural materials are steel and wood, with concrete poured into formwork so precise that the underside of the building looks polished. The floor is a concrete structure, the roof steel and wood; the floor and roof run parallel to each other. To follow the geometry of the shells required 1400 different moulds for concrete. The concrete pouring involved delivering concrete continuously over a period of two days, to achieve the complex task of creating one continuous flowing roofspace. As the building is made up of a single structure, all the elements, including the roof, have to be flexible, to accommodate minute changes in dimension caused by natural and structural movements. The internal ceilings are jointed to accommodate these shifts. The curved glass façades, including those that wrap around the patios, with a total area of 4800 m2, also have to take the movement of the concrete: each piece of glass is cut separately, and each piece moves independently on jointed frames. The Rolex Learning Center is a highly energy-efficient building which, for its low energy consumption, has received the coveted Minergie label – the standard used in Switzerland for measuring environmental excellence in buildings. The building is largely daylit with carefully controlled natural ventilation systems, except for the restaurant and multimedia library, which have cold ceilings. It achieves a 38.5 kWh/m2 (139 MJ/m2) energy consumption thanks to high quality double-glazed windows, 20cm of insulation in the roof and up to 35 cm in the ground, exterior blinds, natural lighting and ventilation, and because it takes advantage of the 25-year-old installation of thermal pumps that use lake water for cooling the whole campus. This degree of energy efficiency was achieved by the pioneering engineering firm Sorane SA, based near to the campus and comprised of engineers from Lausanne and Zurich. Using digital modelling for airflow, lighting, and thermal measurements, the firm increased the energy efficiency of the new building to a technical maximum while at the same time ensuring the safety of its users in case of a fire. Obtaining the Minergie label is an even more outstanding achievement given the energy challenges of an open plan building.